You are free to explore new closing or fixing modalities or to reinterpret with new shapes and aesthetic choices products that are already available in their catalogue. For more information about the product typology, please refer to the Material files. Functions: the researched products shall both serve a decorative function – hence they must be a good fit for the various products they are meant for (clothing items, footwear, leatherwear, etc.) – and the specific function (closing, fixing, adjusting, etc.) that each product is required to perform according to its typology. Style: you are free to reinterpret the style of the products already available in their catalogue (see Material files) or to propose an innovative style, always keeping into consideration the market the company operates in, with a special focus on the street wear world. Materials: the elements you are invited to develop might use one or more materials, among: PA, acrylics, resins, zamak and rubber. Production technologies: the collection of products you propose shall be industrialisable, hence manufacturable through large scale production technologies, including moulding and lathing. Target: the products you propose shall be conceived for a wide public, with a particular focus on the average customer of street wear products. Deliverables: upload all the images that better present your collection (rendering, descriptions, CAD files, etc.) presenting at least one view with the product placed on a clothing item or accessory and preferably attach also the 3D file in STEP or IGES format inside a .ZIP archive. Participation is free of charge and open to designers and creative talents of any nationality aged 18 years or older. Participants can present one or more projects, but only the projects published on the www.desall.com web site, via the upload page related to “Lampa Award 2018” will be accepted. The selection of the winner by Lampa will be the result of an unquestionable evaluation and it will take into account originality, feasibility and consistency with the brief presented. For the duration of the option right, the Sponsor offers an extra chance to all participants setting a fee of Euro 1,000.00= (one-thousand/00) for the purchase of the license for the economical exploitation of the projects not-acknowledged as the winning proposals. 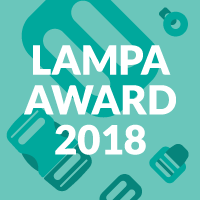 Do you want to stay updated about "Lampa Award 2018"?